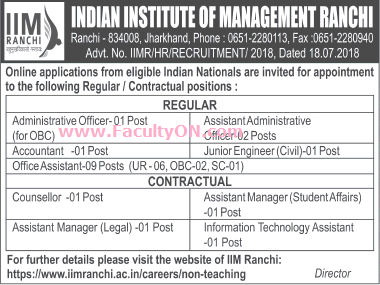 Indian Institute of Management (IIM) Ranchi has advertised in THE TIMES OF INDIA newspaper for recruitment of Non-Teaching Faculty jobs vacancies. Interested and eligible job aspirants are requested to apply on or before 01st August 2018. Check out further more details below. About College: The ninth Indian Institute of Management was established at Ranchi in 2010. This was made possible with the extensive support of the Indian Institute of Management Calcutta and the Government of Jharkhand, working under the guidance of Ministry of HRD, Government of India. Assistant Administrative Officer: PB-2, Rs.9,300 - 34,800, Grade Pay Rs.4,600/- as per 6th CPC / Basic Pay Rs.44,900/- in Level 7 as per 7th CPC. Office Assistant: PB-2, Rs.9300 - 34800, Grade Pay-Rs.4200 as per 6th CPC / Basic Pay Rs.35,400/- in Level 6 as per 7th CPC. Junior Engineer: PB-2, Rs.9300 - 34800, Grade Pay Rs.4200 as per 6th CPC / Basic Pay Rs.35,400/- in Level 6 as per 7th CPC. Basic Pay INR 35,400/- in level 6 as per 7th CPC. Counsellor: Consolidated Salary will be Rs.35,000/- to Rs.40,000/- per month. Assistant Manager (Student Affairs / Legal): Consolidated Salary will be Rs.35,000/- to Rs.40,000/- per month. Information Technology Assistant: Consolidated Salary will be Rs.25,000/- to Rs.30,000/- per month.